It has been depicted in artwork, and lamented in poetry and prayer for nearly 2,000 years: the exile of the Jewish people from their homeland in the first century AD. But what if it never happened? That is the central, provocative question explored in EXILE, A MYTH UNEARTHED, which looks at exile through the lenses of archaeology, history, myth and religion, and asks what it means for the contemporary struggle over land in the Middle East. Under canvas tents set up as protection from the burning sun, the members of an archaeological team painstakingly clean artifacts unearthed from the ancient town of Sepphoris, in Galilee, 150 kilometres from Jerusalem. Their findings are revolutionizing our understanding of Jewish history - including the central myth of Jewish exile following the destruction of the Second Temple during the fall of Jerusalem in 70 AD. While Jews may have been driven out of Jerusalem, it turns out they continued to thrive in Galilee, in places such as Sepphoris. The town also had a pagan temple, Roman theatre, bathhouses and mosaics depicting human figures - all taboo in Jerusalem. According to archaeologist Zeev Weiss, who began the excavations in 1985, the evidence here doesn't point to exile, but to growth and expansion after the destruction of Jerusalem. Sepphoris, and most of the Galilee's, refusal to join the rebellion testifies, according to Columbia University Prof. Seth Schwartz, to a politically and culturally divided society, rather than the image portrayed over centuries of a "national" Jewish uprising. As the film travels from Sepphoris to Masada and Jerusalem, and on to remote caves in the Judean desert and the catacombs of Rome, a picture emerges of a complex relationship between Jews and Romans, and between Judea and the Jewish Diaspora. "The Romans did not force people into exile," says historian Israel Yuval. "This is a Biblical image based on the Babylonians and Assyrians, but it was never Roman policy." 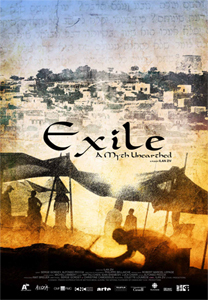 EXILE, A MYTH UNEARTHED features interviews with leading historians and archaeologists (see this list of participants), and takes us into the field where they are conducting their work. Throughout the film we also return to a group of tourists visiting sites in the Holy Land, and hear the traditional interpretation of events such as the siege of Masada - an interpretation which stands in sharp contrast to the evidence unearthed in recent decades. Until 1948 a predominately Muslim Palestinian village named Safuri stood on the ruins of the ancient Sephoris. In 1948 the village was destroyed and its inhabitants fled. Is it possible that some of the Palestinian refugees from Safuri are decedents of the ancient Jews of Sephoris who were never exiled? Ilan Ziv opens the film with this question and returns to it in the end: "What is being unearthed here in the ruins of Sephoris and Safuri is a message of hope, and a warning. The promise of hope from a town that survived for hundreds of years because of its capacity to embrace many cultures and traditions. And a warning contained in the destruction brought about by blind faith in a single narrative of history at the expense of others." Re-thinking exile might overturn long-held beliefs. But it might also point to a richer, more diverse past than we imagined, a past which potentially could inspire future generations to imagine a different future.